“Lake Living Lifestyles is all about how we live, whether it is at Lake Gaston or beyond. By building relationships with our family, friends and community, we create our lifestyle.” The design team of Mary Sherwood Lake Living is ready to help you design your own lifestyle. Visit their unique, eclectic retail boutique for a memorable shopping experience or work with their designers to help you transform your home. Let them work with you to design your lifestyle! Incorporating that unique lifestyle concept, the Mary Sherwood team took The Roanoke Valley Rocks concept and made it their own. 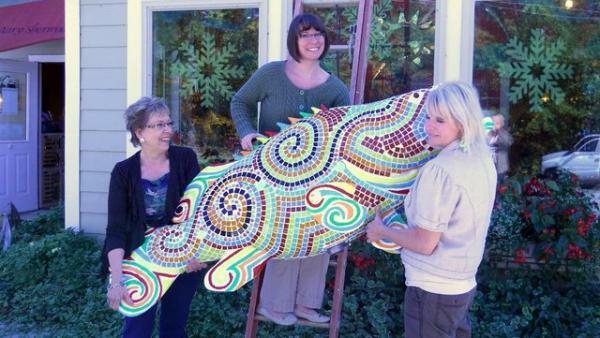 Their brightly colored, mosaic tiled fish, aptly named Swish, is an amazing work of art by designer Autumn Wenger with painted “swishy” fins that mirror the design and colors of the tiles. But the creativity of the Mary Sherwood staff did not stop with Swish’s design. Instead of being located inside the shop or mounted on a pole outside, Swish is getting a bird’s eye view of Lake Gaston living from his perch atop the roof of Mary Sherwood’s building. The staff is pictured here (l-r) Mary Sherwood, Autumn Wenger and Traci Watson climbing to new heights to mount Swish on the roof.